THIS FRAME IS ON BACKORDER until approximately 5/10. Orders will be placed on hold until we get more inventory. Apologies for this delay. Love the Art Deco design of this frame. I went perfectly with the collage I had in mind for it. Beautiful carved Art Deco frame! This frame looks great with my Diego Rivera painting. It compliments the artist's style and color palette. The carving causes the light reflected on it to increase your awareness of both shades of gray and black. This new frame has enriched the painting and the room where it hangs. Loved the nouveau look. I'm framing a pastel painting of peonies and thought this frame looked very special with it. 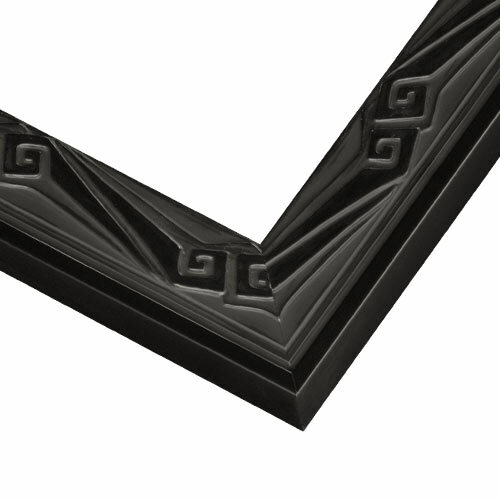 The carved design of this molding complements the Diego Rivera style of painting in the print I am framing. I am also adding a double mat to it. My art is 4" x 6" - why can't I select smaller than 5"? BEST ANSWER: Hello Melinda! The minimum size available for this frame is 5" . All our frames are Custom Cut by hand, and we want to ensure the safety of the Machine Operators when cutting such small sizes. Thanks! is there a way to get a sample of the frame? BEST ANSWER: Hello Dina! Thank you for reaching out to us. If you would please click on the image of the frame, then look at the bottom right hand side. You will see a box that says 'Can't decide, order samples'. If you need assistance, please give us a call at 1-800-332-8884. Happy Framing!